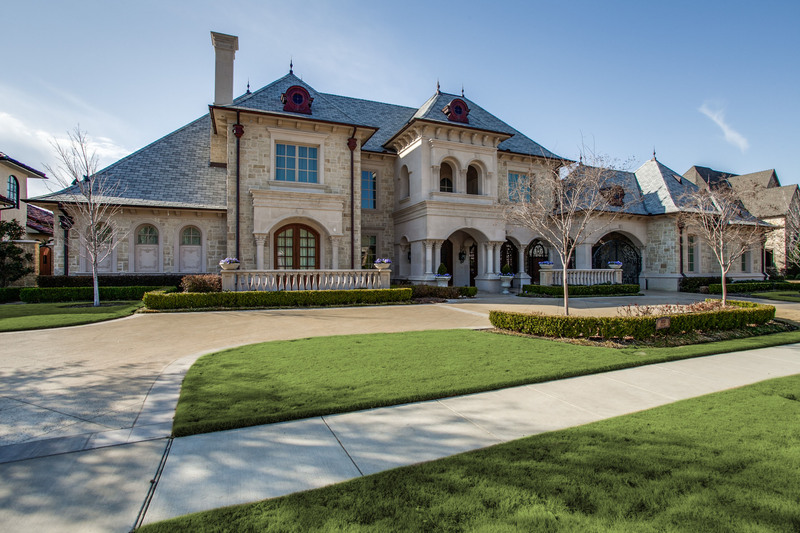 Situated in Frisco’s prestigious Villages of Stonebriar Park with a gated entrance, 2933 Belclaire Drive spectacular French stone residence, with cast stone accents and a slate roof, nestled on a gorgeous 0.82-acre, gated estate with a circular drive and fabulous drive-up appeal. The design elements in this stunning residence are unparalleled. Showcasing a finish-out of the highest quality, details include 12-foot ceilings, spacious entertaining rooms, gleaming hardwood, marble and limestone floors, gorgeous wrought iron detailing, deep molding, custom lighting, and fabulous limestone, marble, and granite finishes throughout. The two-story residence offers approximately 9,956 square feet, five bedrooms, five full and three-half baths, eight gathering areas, two dining areas, an elevator, three fireplaces, four wet bars, balcony, covered verandas, covered loggia with outdoor fireplace and kitchen facilities, gorgeous infinity pool, immense landscaped backyard, five-car garage and an automatic gate. Enter through double wrought-iron-and-wood doors to a dramatic entrance hall, which gleans with a two-story dome ceiling trimmed with hand carved cove molding and exquisite marble-patterned floors, whose texture is deftly highlighted by a gorgeous curving stairway with wrought iron-and-wood balusters leading upstairs to the second level. A fabulous wrought iron balcony also looks down to the first floor. Serving the space is a professionally equipped panic room, a coat closet with abundant storage and a nearby exquisite marble powder room, with elegant wall coverings. Additionally, an elevator serves both levels of living and speakers for selected sound are located throughout the house. Providing for great entertaining flow, the entrance hall leads through arched entries to the formal dining room, study, master suite, and to the rear of the home. Capped by a one-step, ornately carved cross-beamed ceiling, the exquisite dining room is graced by a fabulous oversized crystal-and-iron chandelier, handsome hand-scraped wide-plank hardwoods, deep cove molding and double Palladian French doors, with elegant drapery, opening to a front covered veranda. The dining room also leads through a wet bar to the kitchen. The fully equipped marble wet bar boasts a bar sink, two richly paneled SubZero refrigerator drawers, illuminated leaded glass top cabinets and a bar serving area. Crowned by an ornately carved, cross-beamed ceiling with a wood carved alabaster chandelier, the oversized richly paneled study is centered by a massive wood-burning fireplace, with a marble surround and a wood-carved mantle with a flat screen above, and also features abundant built-ins bookcases with storage. Light-filled French doors, with elegant drapery, yield natural light on the hand-scraped hardwoods and open to a front covered veranda. The oversized great room is the heart of the home and is capped by an ornately carved, cross-beamed ceiling with an oversized iron chandelier and is framed by a cast stone wood-burning fireplace with trumeau. The great room also showcases hand-scraped hardwoods, a wall of richly stained built-ins, and Palladian windows overlooking the gorgeous pool area. French doors also open to a covered veranda. Additionally, the great room flows to a professional chef’s granite kitchen, which showcases a beamed ceiling, ornately carved, richly stained custom cabinetry, hand-scraped hardwood-and-limestone patterned floors, premier stainless steel and paneled appliances, including Wolf, SubZero and Kitchenaid, a dramatic vent with pot filler faucet, immense island with an antique copper bar sink, two recycling centers, an antique copper double bowl sink, two expansive breakfast bars, and a huge walk-in pantry, with granite counters, abundant storage and a 12-foot door opening to the side grounds. The kitchen also opens to a large breakfast gathering area, which features double French doors, with elegant drapery, opening to the covered loggia and pool. A back staircase with wrought iron-and-wood balusters leads upstairs. Down the hall, a housekeeper’s office, with its own desk area, is highlighted by limestone counters and floors, a dog kennel, mud nook, and an elegant marble powder room. A door also opens to the outdoors. Fully equipped, an adjacent oversized utility room houses abundant built-ins with granite counters, including a desk area and an expansive island, limestone flooring, elegant toile wall coverings, a drip dry area, closet, and also provides room for two sets of full-sized front loading washer and dryers. Two bedrooms are located on the first floor. Enter the luxurious master suite to an elegant gallery, which is accented by a fabulous marble wet bar with a stainless steel hammered bar sink. Adjacent, an oversized exercise room is highlighted by a three-step ceiling, mirrored walls with paneling, rubber exercise flooring, and an expansive marble wet bar, which boasts a glass-tiled backsplash, stainless steel bar sink and a paneled refrigerator. The nearby gorgeous oversized master bedroom is crowned by a two-story paneled ceiling, with decorative chair railing and hand-finished cove walls, and is also graced by a crystal-and-iron chandelier and a marble fireplace, which has an ornately carved wood mantle and is flanked by oversized built-ins. The bedroom also features hand-scraped hardwood floors and an adjoining sitting area with windows overlooking the fabulous pool and French doors opening to the covered veranda. The nearby sumptuous marble bath is accented by groin-vault ceilings with Italian wood chandeliers, clerestory windows with wrought iron detailing, dual vanities plus a Hers makeup counter, a jetted tub with antique mirror detailing above, separate double shower, and His and Hers huge walk-in closets with abundant built-ins. Additionally, a generous-sized guest suite is replete with a one-step ceiling, neutral carpeting, an elegant full marble bath with a large walk-in closet, and French doors, with elegant drapery, opening to the outdoors. Second level of living is equally sumptuous. Ascending the front staircase, first stop leads to French doors opening to a front balcony, which overlooks the gorgeous front landscaped grounds. There are three additional bedrooms, which range in size and style, some with elegant marble or limestone baths and all with one-step ceilings, deep molding, elegant drapery, neutral carpeting, limestone-topped desk areas and huge walk-in closets. Professionally equipped, a richly paneled media room is oversized and appointed with a pop-up, richly-stained cross-beamed ceiling, decorative wall coverings and carpeting, a theater screen, professional projection equipment, and an expansive marble wet bar with richly stained cabinetry, a bar sink, and a SubZero paneled refrigerator. Perfect for relaxation, an oversized game room features a one-step ceiling, neutral carpeting and a large granite-topped built-in desk area with abundant storage and triple flat screen televisions above allowing for multiple game and media watching. A marble powder room serves the area. Adjacent, a playroom, capped by a vaulted ceiling, is spacious and also includes a flat screen television, neutral carpeting, a large electronics closet, and attic and storage space. Down the hall, a huge closet and attic room provides for more abundant storage. Outside, the gorgeous backyard grounds and pool is an entertaining utopia. Marked by stone columns with arched entries, the incredible stone covered loggia, with limestone flooring, is crowned by wood beamed, bead board ceiling with ceiling fans and recessed lighting, and is also framed by a cast stone wood-burning fireplace, with a raised hearth, and a stunning vaulted, beamed dome ceiling above. Additionally, the loggia showcases expansive kitchen facilities, which features richly stained custom cabinetry, granite counters, huge bar serving areas, and premier stainless steel appliances, including a SubZero wine cooler refrigerator, three refrigerator drawers, a Viking grill with an oversized vent above and a double bowl sink. All overlooks incredible views of the stunning pool and spa with waterfalls and its stone mountain with slide. Additionally, a staircase, with a gorgeous cast stone surround, leads down to the huge verdant landscaped grounds, which area surrounded by mature trees, with landscaped lighting, and fabulous Zoysia grass. The huge backyard provides room for a future tennis court if desired. Conveniently serving the outdoors is also a pool bath and pool storage closet. An attached three-car tandem garage with a huge storage closet, featuring abundant built-ins with granite counters, an additional two-car detached garage, and an automatic gate completes this spectacular estate.